This easy-to-use, all-purpose enamel adheres to most surfaces. Perfect for painting tree stands, boats, or blinds, this permanent paint is long lasting and colorfast. The kit includes a leaf stencil and instruction sheet, and comes with four 12oz cans of permanent spray paint: marsh grass (tan), mud brown, flat black and olive drab. A great addition to your hunting gear. This easy-to-use, all-purpose enamel adheres to most surfaces. Perfect for painting tree stands, boats, or blinds, this permanent paint is long lasting and colorfast. 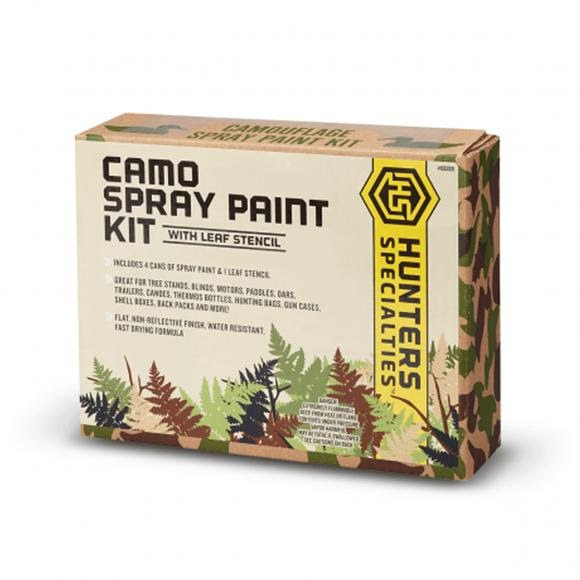 The kit includes a leaf stencil and instruction sheet, and comes with four 12oz cans of permanent spray paint: marsh grass (tan), mud brown, flat black and olive drab. A great addition to your hunting gear.